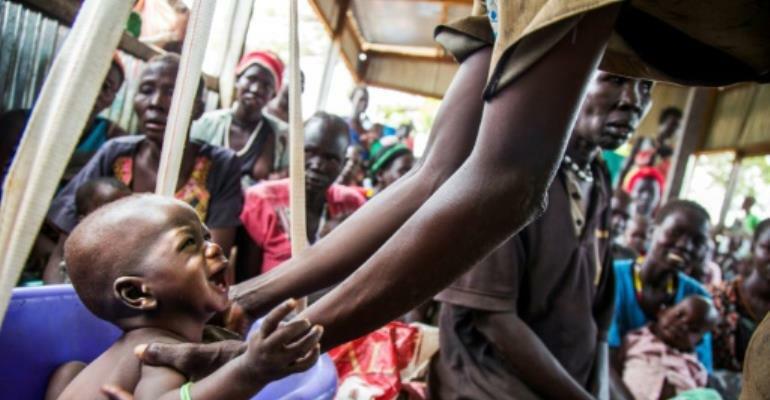 Nearly half of the population in war-torn South Sudan is experiencing extreme hunger, with many more set to run out of food as famine looms, government and UN agencies said Monday. A year after South Sudan became the first country in six years to experience famine, due to a drawn out civil war, its National Bureau of Statistics warned that 40 percent more people were going hungry this year, even before the lean season sets in. The state bureau said in a statement that in January 5.3 million people, representing 48 percent of the population, were facing acute food insecurity. "Improved access and a massive humanitarian response succeeded in containing and averting famine later last year. Despite this, the food insecurity outlook has never been so dire as it is now," said a joint statement from three United Nations aid agencies. Four years of civil war have devastated agriculture, while prices have soared and rains have also been unreliable. The country has also been hit by crop-destroying armyworm caterpillars. "The situation is deteriorating with each year of conflict as more people lose the little they had. We are alarmed as the lean season when the harvest runs out is expected to start this year much earlier than usual," said Adnan Khan, World Food Programme (WFP) country director. The statistics bureau and aid agencies warned that if humanitarian assistance was not stepped up, more than seven million people could become food insecure -- two thirds of the population. Eleven counties are at risk of famine. Without assistance, as of May, more than 1.3 million children under five will be at risk of acute malnutrition. Allain Noudehou, the UN Humanitarian Coordinator in South Sudan, told a press conference that only 5.5 percent of $1.7 billion (1.3 billion euros) in aid needed in 2018 had been received.